Dealing with a bathroom can be a headache. The sheer variety of elements that come into a full-on bathroom remodelling job can be challenging to say the least. At Home Upgrade Specialist, though, we make sure that your bathroom remodelling needs can become a fraction of the challenge they presently provide. Whether you want to modernize and improve on present plumbing appliances or you want a new look, we can help. From making the most of the space that you have to turning your humble bathroom into an elegant spa, we’re here to help. Everything that we have to offer is about making sure you can get the space, style and selection to fit your needs perfectly. We can also help to make your bathroom more energy-efficient, too, using green energy sources to keep everything ticking along and smiling. 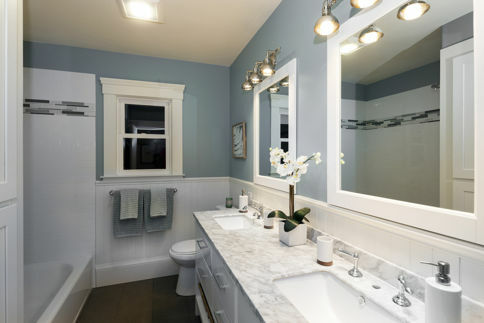 There’s a lot that can come into a bathroom remodelling program. From fixing the lighting and plumbing to handling those minor details, there’s lots to consider! A bathroom that’s easier to run. A bathroom that’s more affordable to run. A bathroom that lives up to green standards. An awesome design that really sells your bathroom in the perfect light. High quality safe, certified plumbing and electrical fitting. Aesthetically on-point tiles and flooring to fit your own needs. Changes to bathroom appliances, from spa fitting to bath-to-shower conversions. So, whether your problems stem from wanting a remodel or needing a new layout entirely, we can help you out. With our expertise in bathroom remodelling, you can trust that we’ve got the skills needed to do the job just right! We’re proud to be trusted experts when it comes to bathroom remodelling, and that shines through in the attention to detail we pay to every job that we do. Rather than just changes for changes sake, though, we push a medium that’s more about creating a platform that makes positive, progressive changes. From helping the environment to reducing energy costs, our bathroom remodelling plans are more than just cosmetic. For an appealing aesthetic change that also delivers a functional benefit, contact our team today. You can book an online appointment regarding bathroom remodelling with Home Upgrade Specialist today. Just let us know what you are looking for, and our experts will be more than happy to oblige. Call us on 833-446-6387, or message on our Contact Form, and we’ll arrange a consultation at your leisure!